Around Lake Osoyoos the landscape is lush and green on one side and mountainous and desert-like on the other side. Vineyards line Lake Osoyoos in the Okanagan-Similkameen Region of BC, and this is a popular area for tourists especially during the summer. Lake Osoyoos is surrounded by a stunning landscape of untouched land and vineyards and it is a popular destination in the Okanagan-Similkameen Region of British Columbia. It is especially popular in the summer, when the temperatures are high, the lake water is warm and the vineyards are bursting with grapes. Lake Osoyoos is described as the warmest freshwater lake in Canada, and while many are glacier fed so that even in the height of summer they are still quite cool, this one heats up to a nice temperature and it is a pleasant area to spend some of your vacation. Water activities are also permitted on this lake so you can not only enjoy the swimming and splashing around, but you can also use your boat or rent a canoe. ... It seems strange that two distinctive terrains can exist just across a lake from each other, but that is part of what makes this region and this lake so special and so unique. 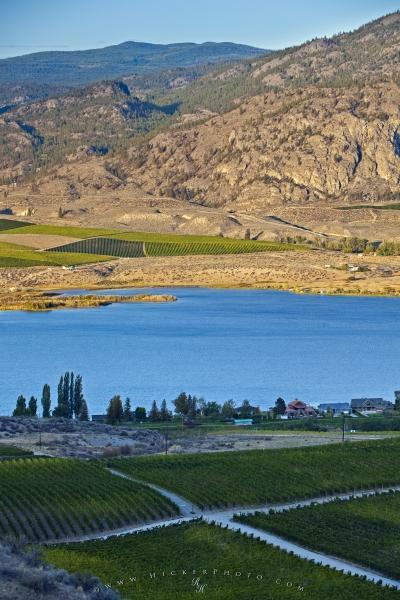 Landscape and vineyards lining Lake Osoyoos near the city of Osoyoos, Okanagan-Similkameen Region, Okanagan, British Columbia, Canada. I photographed this photo with the digital SLR camera model Canon EOS 5D Mark II, aperture of f/6.3, exposure time of 1/30 sec. on ISO 100, as always I used a original Canon Lens, the focus lenght for this picture was 105mm.